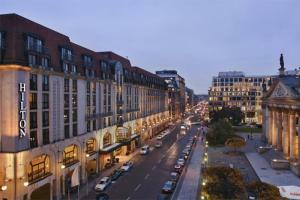 This hotel in the heart of Berlin offers easy access to the city's most popular activities and historic landmarks. Guests can visit the Berlin Wall, enjoy fabulous shopping in the city center or play a variety of sports from tennis to golf nearby. Well-appointed contemporary guest rooms are a haven of serenity, offering picturesque views of the city or hotel gardens. Four unique restaurant experiences will delight and surprise guests. Located in the city center a short drive from the city's two major airports and within walking distance of Berlin's major attractions.